The amount of waste created by central Ohio residents and businesses is staggering. In fact, every resident generates an average of 4 or 5 pounds of waste each day. With only so much landfill space available, it's more important than ever that we reuse, recycle, compost or divert as much as we can. The Village of Urbancrest wants to make proper recycling as easy as possible for you so we provided each resident with recycling containers to place acceptable items in for recycling. Please place these containers at the curb on your recycling day under the same guidelines as your trash. 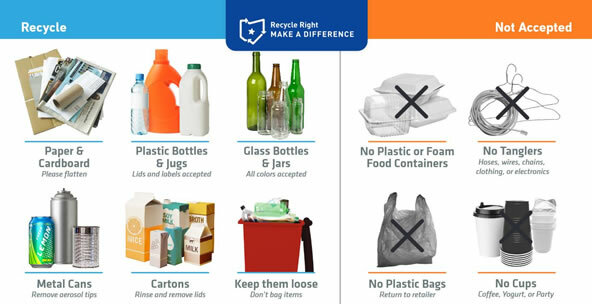 If your recycling container becomes damaged or if you need an additional container, please contact Local Waste Services at (614) 409-9375. Don't just recycle. Recycle Right. It's not only important to recycle. It's important to Recycle Right. Have a question about what's accepted or not accepted for recycling? Visit SWACO's Frequently Asked Questions page at http://www.swaco.org/faq.aspx?TID=16. Have an Unwanted or Hard to Recycle Items? Visit SWACO's "Reuse and Recycling Search Tool" to find the best solution for your unwanted item at http://www.swaco.org/251/Recycling-Reuse-Search-Tool. Please have your trash, recyclables, and yard waste at the curb on your collection day by 7:00am but no earlier than 7:00pm the day before your collection day. If there is a holiday prior to your collection day (holiday on Monday and your collection day is Thursday), your collection day will be delayed one day. If your collection day falls before the holiday, your service day will remain the same. - Residents are responsible for providing their own trash bags and containers. - Each bag or container must weigh less than 50 pounds. - A rolling trash cart may also be available to rent. This charge is independent from your trash service bill and is set up directly with local waste hauler. •	Explosive items, radioactive waste, and other materials that could be dangerous to the workers collecting your trash. To learn more about what is acceptable in your trash, and how to properly dispose of or recycle items that do not belong in the trash, please visit SWACO's website at www.swaco.org and click on the "Diversion" tab. 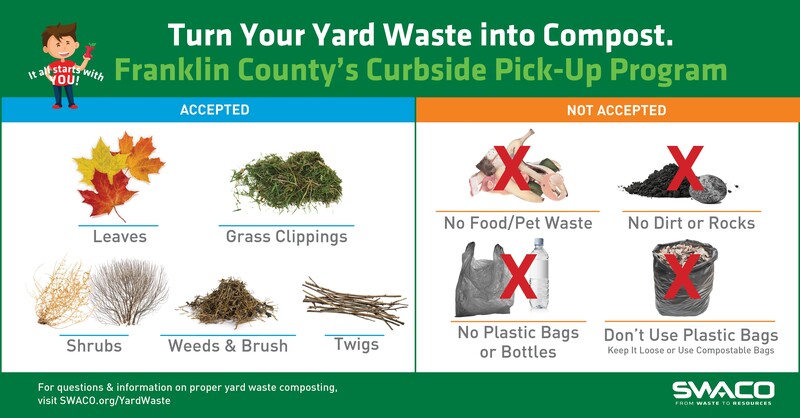 Leaves, grass clippings, shrubs, weeds and brush, and twigs and small branches are all considered yard waste and are not accepted at the landfill. “Yard Waste Only” stickers can be obtained from the City to place on waste receptacles designated for yard waste. Do not place yard waste in plastic bags –use only biodegradable paper bags (available from hardware and grocery stores) or clearly marked rigid containers. Christmas trees – whole trees, no decorations, no lights, no tinsel, no garland. Do not place trees in plastic bags. Only yard waste is permitted in yard waste bags and containers. Please do not place food/pet waste, dirt or rocks, plastic bags or bottles, sod, soil, or plastic plant pots into yard waste bags or containers. Please do not use plastic bags to collect yard waste. Keep it loose or use compostable bags.